The Palacio Paz near the Plaza San Martín in Retiro is just amazing. The magnificent building was commissioned in 1902 by José C. Paz, the founder of "La Prensa". La Prensa is a major daily newspaper based in Buenos Aires. The French architect Louis Sortais designed and erected Paz' mansion which was completed in 1914. Clearly, this mansion was build to impress visitors and locals alike reflecting the owner's power and wealth. Back then, it was the largest private residence in whole Argentina with unimaginable 12,000 sq meters. Justifiably, this building is considered one of the most beautiful palaces in Buenos Aires. It is full of beautiful art work and gorgeously decorated halls and rooms. 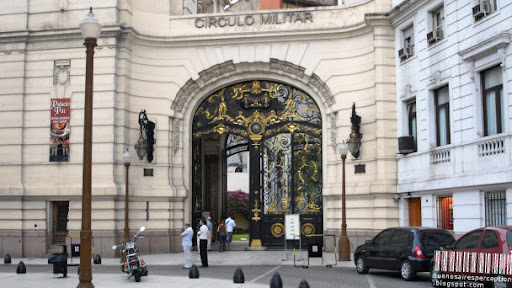 Today it is housing the Círculo Militar, a veterans' organization. The first of the month has arrived, and it is City Daily Photo Theme Day. November 2009 theme day is Doorways. If you like to see other interpretations of this subject click here to view thumbnails for all participants. Few cities in South America have kept all this beautiful architecture. Great shot. Buenos Aires é muito linda. Estive em 2008. Voltarei. Conheci o Palacio da foto. Na oportunidade fiquei proximo a San Martin. Stunning is the only word. But, I'll bet people get so accustomed to it they never even see it as they pass by or pass through. I know that's how I am. It would be interesting to see inside. What a grand and magnificent entrance! I hope you can give us close-ups of its intricate details one of these days. That is one spectacular gate!